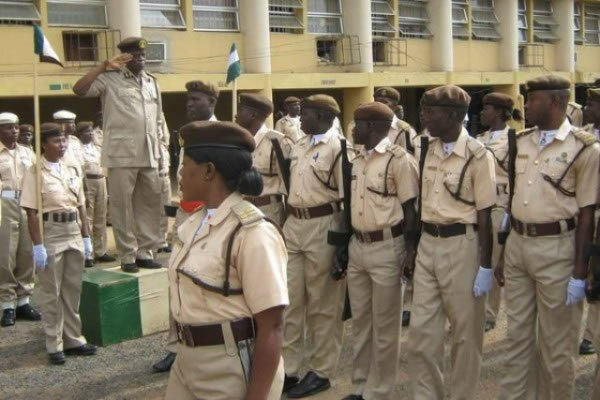 The Nigerian Immigration Service in Ekiti State has arrested a 35 -year -old woman , Mrs Mary Omowaye, for alleged plot to traffic three ladies to Italy for prostitution . The service also apprehended the three victims at the point where Omowaye was attempting to procure travelling passports for them at the NIS Office in Ado Ekiti, the state capital . The victims are Abiodun Adegoroye ( 24 ) , Titilayo Akinsanmi (30 ) and Motunrayo Adeyan ( 20 ) who are natives of Idanre in Ondo State . Dibia , who said NIS had stepped up efforts to rid the state of human trafficking , child labour and prostitution in the state and to reverse the trend contained in Governor Kayode Fayemi’ s revelation that Ekiti had become a transit state for the illicit business . The NIS boss , who said confession from the procurer ( Omowaye) revealed that Omowaye was operating in connivance with one Mr Jamiu , who normally processed travelling visas for victims in Lagos and her sister, Jumoke , who is based in Italy . She said , “One of our responsibilities is to stop human trafficking and child labour. When these young ladies came to our passport section to get travelling passports , we interrogated them and we suspected that this could be an illegal migration . “ They said they were trained as hairdressers , but were going to work in Italy as home helps . They said they would work for free for somebody for six months to settle sponsors of their travel expenses and would be free after to work on their own as hairdressers . “ That is the style that traffickers use to trick and traffic the victims to other countries only to get there and use them for prostitution . After interrogating them , we knew that they didn’ t know what they were going there to do . “ What we normally do is to arrest people like these , profile them and hand them over to NAPTIP for prosecution . NAPTIP will continue from this point to arrest the chief syndicate , Mr Jamiu in Lagos and Jumoke in Italy for prosecution . We are also going to reunite the victims with their families for protection, ” she said . The comptroller said most painful and disturbing was the fact that the trend of human trafficking was common among children from broken homes .